Have you ever played at one of “those” places where no matter what you do, you can’t get rid of the single coil buzz? Or you are too close to your computer monitor at home and the noise drives you crazy? As much as we love the tone and response of a great single coil pickup, the bottom line is it can be noisy. This leaves you with three options to resolve it. Just act like nothing is wrong, or even better, embrace the buzz and make it a part of your sound. Shielding a guitar is my preferred method to help eliminate noise. While it’s not 100 percent effective, I find it goes a long way in making single coil pickups as quiet as possible and more usable in a gigging situation. I know some players scoff at shielding because they say it changes the sound, but I feel that is a myth. Using a spectrum analyzer, which gives you a visual snapshot of the sound, I’ve compared the same guitar shielded and un-shielded, and it didn’t register any difference. As a sound engineer, when I mixed guitarists that used shielded guitars with single coils, it never seemed to hurt their tone. 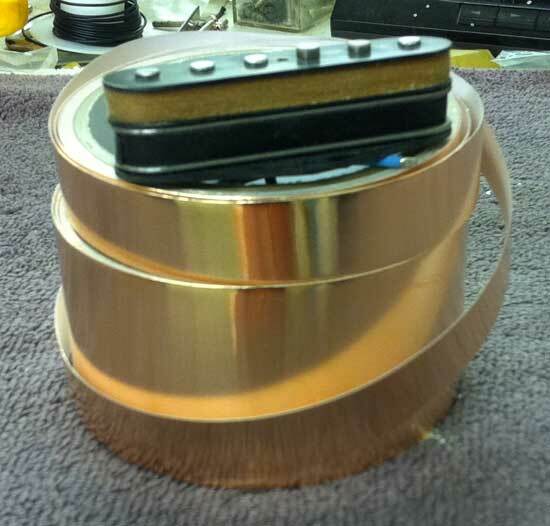 All Crook guitars are shielded using self-adhesive copper tape. I line all of the cavities with the tape and they are connected to a common ground. Though it is a bit time consuming, I think it is time well spent. You can also use aluminum foil to do this, but the downside is you can’t solder to the foil. NOTE: If you want to try this yourself, you can find many videos on the net showing step-by-step instructions on how to shield a guitar. While many purists will dismiss hum canceling pickups without ever hearing them, they do work. Along with a well-shielded guitar, these pickups are the ultimate in quieting a guitar. Companies like DiMarzio, Kinman and JBE Pickups have done a great job in the development of hum canceling pickups. While these pickups may not sound or respond exactly the same as a true single coil, the difference between the two is very minimal now. For years, I have used pickups from all three companies with great results. Don’t let single coil noise get in the way of a great sounding guitar. I think any working guitarist would be wise to have a shielded guitar with hum canceling pickups for gigs at one of “those” places. This entry was posted in Tips and tagged pickups. Bookmark the permalink. I’m excited to hear my Telemaster Jr. with the Kinman bridge pickup. When I was reading about his products on his website, I was impressed that he designs one of the coils specifically to cancel hum and not contribute to the tone (positively or negatively). I’m hoping this yields a superior design. I’ve owned a couple Fenders with their noiseless pickups and over time found that they seem to lack soul, and ultimately replaced the pups with something else…and simultaneously shielded the routing cavities as you described with great results. I’m curious how shielding paint and copper tape compare. I’ve used both and the paint is easier to apply IMO, but I’ve had instances where it was still noisy to my taste and I’ve doubled up. Hi James, I’ve used the shielding paint in the past. I like the tape better. I find with the paint it takes multiple coats to assure coverage. Plus you can’t solder to it. I think more companies would work developing dummy coils etc. if guitar player where more open to change?